When you’re shopping around for a new knife, you don’t want a product designed by some bozo who went to a party knife college like Knife State University (NOTE: may not be a real school). You want a knife made by experts who understand the latest in cutting edge technology (pun totally intended). Maybe that explains why a forthcoming knife that is “inspired by NASA-patented technology” has been able to raise over a third of a million dollars on Kickstarter. How do you get people so excited about a knife? By making some pretty bold promises. 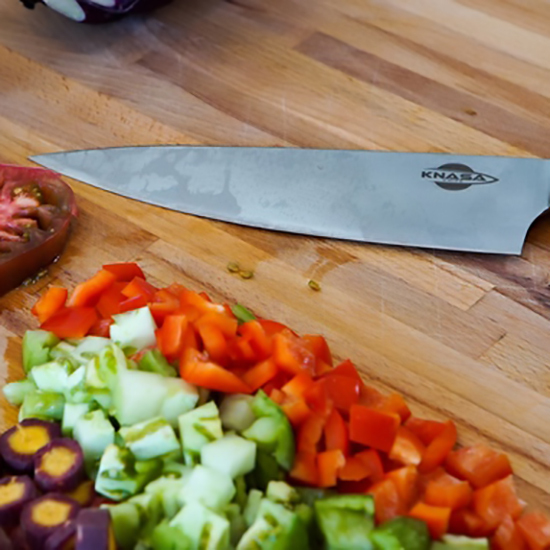 According to Habitat, the company behind the product, KNASA’s “ultra-sharp” edge is made from a “patented alloy, developed by Caltech and tested by NASA” that is “twice as strong as titanium” and “stays sharp 5 times longer than other knives.” It also has “natural nano-serration at the molecular level” that creates “the self-sharpening aspect of the microscopic teeth” for what that’s worth. So what are we to make of this space knife? As with all crowdfunding campaigns, you should always take a buyer beware approach; however, KNASA is offering a money-back guarantee if the knives are not delivered as promised by May 2017. That said, I think more telling is an image about three minutes into the KNASA promotional video. It shows a KNASA knife hovering above the Earth with a little astronaut hanging out by the handle and the Space Shuttle floating above the blade. At that point, you’re either like “Hell yeah I want a crazy outer space NASA knife!” or you might be better off just buying your knives in a store.